The micro-business that pays 2.1 billion yuan and sells 3 yuan of goods to earn 1 yuan of profits is going to go public. According to the Financial Weekly Weekly, there has been news recently that actress Zhang Ting and his client, Weilin Ruiyang's micro-business, Shanghai Darwin Trading Co., Ltd. (hereinafter referred to as “Dalvi”) are preparing to list in Taiwan. According to people close to Dalway, it has already hired Deloitte to settle in, and the planned time to market is September this year. According to media reports, a business agent of Dalway Company said that the listing, the company's monthlyPerformanceMore than 1 million teams will receive shares. As for the number of shares and market value, there is no accurate statement. On April 12th, the "Financial Economics" weekly contacted the mainland and Taiwanese regions to represent the micro-business, both said that the company has plans to go public during the year, but the details are unknown. TST (Ting Secret) was founded in 1996 by Zhang Ting's husband Lin Ruiyang. Its predecessor was Taiwan's famous brand lafee. In 2013, Lin Ruiyang brought TST back to the mainland and established Shanghai Darwin Trading Co., Ltd. in Qingpu District, Shanghai. According to the data of “Enterprise Check”, the registered capital of Shanghai Darwin is 223.7 million yuan, and the other founder of Shanghai Darwin is Zhang Ting. Zhang Ting is also an actor. In 2005, he was exposed to Lin Ruiyang. In 2006, the two registered marriage, and in 2009, they gave birth to women and gave birth in 2012. Lin Ruiyang, once known as the first niche in Taiwan, has starred in the Qiong Yao drama "A curtain of dreams", red all overThree places across the Taiwan Straits. And his wife, Zhang Ting, nicknamed "Dimple Beauty", has starred in a series of TV series such as "The Perfect Colors", "Love through Time and Space", "Wu Mei Niang Legend". It is understood that Zhang Tinglin and Ruiyang couples are now worth 32.8 billion yuan. An entertainment reporter once visited Zhang Ting's home in Shanghai. It is conservatively estimated that Zhang Ting's mansion on the Huangpu River is worth 1.7 billion. The entire top floor was built into a garden. Some netizens said that Zhang Ting is a veritable "micro-business godmother", and their husband and wife dragged the stars of half of the entertainment circle. According to the business registration information, there are 9 major companies in Darwin from the perspective of ownership structure.shareholderAccording to the order of the amount of subscribed capital, the company's top three shareholders are “Shanghai Guangpeng Investment Management Consulting Co., Ltd.”, Shanghai Shengji Biotechnology Co., Ltd. and Shanghai Shangyang Investment Management Consulting Co., Ltd., each holding 36.45%. 33.01%, 13.07%. More striking is that Beijing's most Taoran Clothing Co., Ltd. ranked the fourth largest shareholder with a capital contribution of 15.38 million yuan, accounting for 6.88%. The only shareholder of this company is actor Tao Hong, with a capital contribution ratio of 100%. Tao Hong is also Shanghai. Director of Darwin Trading Co., Ltd. In addition, Tao Hong’s husband, Xu Wei, also indirectly participates in his company. Other than that, inWeiboOn, Zhao Wei, Liu Tao, Zhang Xinyu, He Jie... Most of the stars in the entertainment circle have sunburned their own photos of white masks, and it also shows that this is the secret product of TST. So many stars call TST, and the cargo power is really immeasurable. Compared with many micro-commercial products that are “starting from scratch”, the starting point of TST is indeed much higher. This is also the TST can be in the micro-business. An important factor in the rapid rise. November 2017,Shandong HuapenghairannouncementIt is planned to invest 650 million to acquire the giant billion network held by Shanghai Dalway. The announcement shows that Dawei's revenue and net profit for the first three quarters of 2017 were 3.6 billion yuan and 1.142 billion yuan respectively. This means that Dawell can earn 1 yuan for selling 3 yuan. According to the employees of Zhangting and his wife, Shanghai Darwin has a total of 1,900 groups. He is one of the group leaders. There are more than 300 agents and more than 5,000 employees. The monthly performance of the entire team is about 600,000 yuan, with an average of The agency's monthly revenue is 2,000 yuan. The employee said that Darwin had 7.66 million agents in the country, and according to this calculation, the turnover of Shanghai Dahlwei was as high as 15.32 billion yuan. However, as early as 2016, TST was exposed to unqualified quality. Nowadays, all the big stickers, knowing, and various kinds of posts that share the use of TST "Rotten Face", this "beauty artifact" has become a high complaint rate on the Internet. According to Shi ZhiResearch reportDao, the reporter contacted a woman named "TST victim" on Weibo. Her name is Liu Yin, Sichuanese. She told reporters: "At the end of 2016, I was Zhang Ting's derivative product TST. Attracted, I learned that this product can improve the skin condition, and there are so many stars are using it, so I downloaded the secret app of the court, bought a full set of more than 10,000 TST products on the mobile phone, and also made a gold Card, you can return to the point discount." Liu Yin received the product began to use the instructions every day, but she did not expect, this turned out to be the beginning of her nightmare. "Three months after using TST, my face appeared a lot of acne. The lower part of the whole face was like a disfigured. I didn't dare to look in the mirror during that time. It was like a year, and it can be described as terror. Liu Yin said that she was very depressed. Subsequently, Liu Yin took the TST product to the Huaxi Hospital for examination, and finally obtained the result of the TST ice muscle such as jade repairing the frozen film. Liu Yin found the TST headquarters with the test results, and complained to the Shanghai Food and Drug Administration, but the TST side took out the quality inspection report of the Shanghai Food and Drug Administration, and showed that the product has no quality problems, Liu Yin’s article The road to rights protection was thus killed. Liu Yin told Yan valued that there were several victims who were in the same situation as her. They were suffering from no rights and no way to give up. Today, Liu Yin has become allergic skin, the skin layer has become very thin, and acne has been repeated, which seems to be her heart disease. In addition to TST's products involved in many quality disputes, and its grading sales model has repeatedly led to pyramid schemes. According to TST propaganda, today they have more than 7 million agents, as they advertised in the advertisements, "We are different from traditional micro-businesses, which contain sales models, precisely because of the temptation of their sales model. In 1 day, the number of new agents reached more than 10,000. This is incredible. Everyone has agency rights, and everyone can sell TST products." Similar to most direct sales systems, TST also has a mature reward mechanism. The higher the agent level, the higher the score. Some agents know that the cost of TST products is extremely low. Tmall flagship store sells 298 yuan of live yeast mask, and the price is 14 yuan. According to an agent who is doing TST, TST divides all agents into gold and small gold card agents. 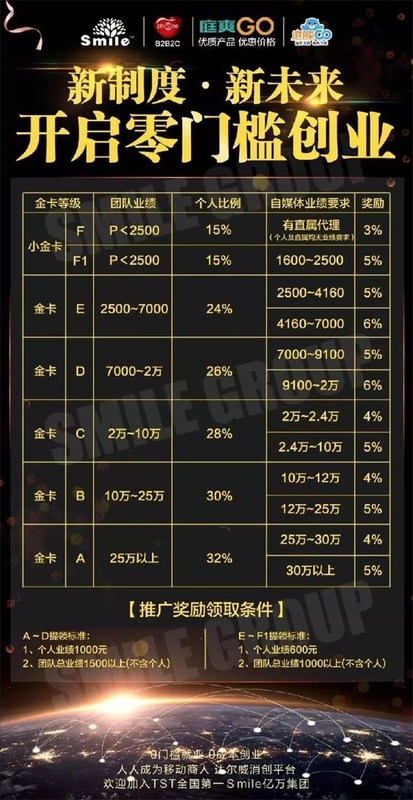 The salary of the small gold card is composed of two parts: the performance is below 2500, and the personal sales commission is 15%; in addition to this, there is a so-called self-media promotion award, which requires your team performance to be below 2500, but you sell it yourself. The goods reach 600, the total performance of your direct agent is more than 1000, and you have a 3% self-media promotion award for your total performance. The gold card needs to meet the monthly performance of 2,500 yuan, the gold card members are divided into A-E grades, and the commission ratio of each level is also increased step by step according to the team performance. Not only that, but also the so-called batch zero difference bonus. Jinka agent can not only be drawn, but also recruit agents and form their own team. 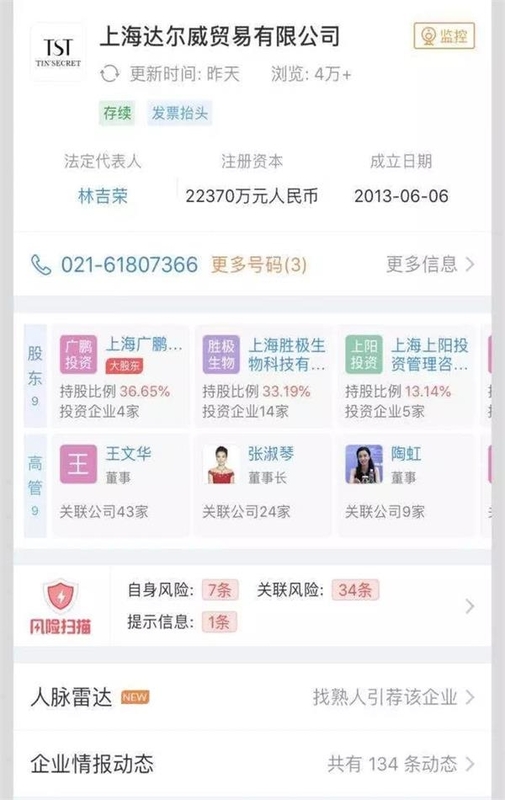 Azi, the head of TST Southwest Region who had been clinging to Lin Ruiyang’s fingers, introduced her team’s monthly retail sales to over 400 million yuan. The total sales volume exceeded 8 billion yuan, and such a huge amount can be thought of. However, this business model repeatedly emphasizes that your bonus is only related to the bonus of your direct agent development, and there is no relationship with the downline of the downline. As a result, it seems that the three levels of organization and leadership of pyramid schemes cannot be formed. There are only two levels. This shows that TST has been working to avoid the risk of pyramid schemes. Not only that, TST has been legally and taxed in compliance, which is indeed much better than many MLM companies. However, the TST model seems to have only two levels. The legal regulation is the rebate level rather than the surface mode. The TST rebate level has already exceeded level 3. At a large agent event at TST, Lin Ruiyang said: "I am willing to help you. You have to step on my shoulder and step on the shoulder of a giant and tell everyone that he is my brother!" There are many videos of Zhang Ting couple interacting with agents. Lin Ruiyang claims to be a big brother, and Zhang Tingxiu loves it. He also speaks to franchisees. The content is mostly inspirational chicken soup about TST brand. This is even called “large” by some netizens. Brainwashing scene." Looking for Taiwan's listing this time, from the perspective of performance, TST does have strength, but its quality and service attitude are still a lot of problems. The star platform does not represent quality and effect. No matter where it is listed, Zhang Ting and his wife need to make a good decision for their products.